Whittled down to the basics, a wristwatch is essentially an instrument that displays the current time. Beyond this basic function, watches have become a product that designers, brands, and consumers have molded to cover every purpose – and price tag. From disposable accessory to high-fashion, simple two-hand movements to unbelievable complications, there is a wristwatch out there for any preference. The Runwell presents as a field watch but comes with signature Shinola details. The Shinola Runwell Sport clearly sits on the functional side of the spectrum, but it does provide enough thoughtful detailing to set it apart from the crowd. The case measures in at a now-typical 42mm in size, but the rounded bathtub design means it will sit well on a range of wrists (the lugs extend out and down just like cast iron bathtub feet). Best described as a field watch, the all-business persona comes from the matte black PVD coated case, strap hardware, bezel and dial. On the other hand, rather than descend purely into a hard military look Shinola chose to soften the blow with their signature retro-inspired details such as slim sword hands, thick sans-serif numerals reminiscent of a school clock and an onion crown. The only source of color comes from the orange seconds hand and the Shinola lightning bolt at 12 o’clock. The Runwell has the basics of timekeeping covered. The watch is powered by Shinola’s Argonite 705 movement and is assembled right in Detroit, Michigan. A quartz watch is an excellent choice for an everyday piece as it provides reliable accuracy and the user is not required to be conscious about hand winding or running down the power reserve as in an automatic movement. It covers the basics of timekeeping and should the need for simple timing arise, the bezel is a uni-directional affair that snaps into each increment with authority. Another great concession for daily use is the choice of a nylon NATO strap over leather. While leather does acquire a fantastic patina with use, it may age and stain rapidly without due care. 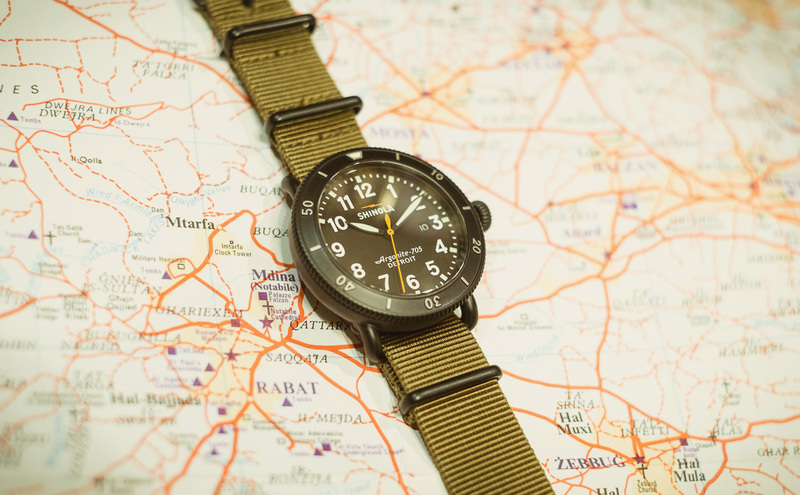 The pictured strap is in the style of the original band, but is an aftermarket band from NATO Strap Co.
As a rugged time instrument the Runwell Sport succeeds at its mission quite well. Readability, materials and build quality are all excellent. I would recommend this piece to someone who is looking for a sharp looking field watch that can withstand the daily grind. Backdrop: Keen geographers and cartographers may notice the cities on this map and identify the location correctly. It is a contemporary, undated map published by Geographia, Ltd. of 63 Fleet Street, London. Geographia was a publisher of globes, maps and atlases from the early 1900s to the late 1980s. They were eventually absorbed into Collins Bartholomew. Visit the Shinola website for more information on their watches and accessories.